The second week of State Volleyball League saw a revised draw and some tough games for the UTS teams. A quick run down from each team follows. There will now be a couple of weeks off while National Juniors is played, which will give the teams some time for some extra training and fine tuning. Captain Rob “R-Fleur” Fleury, was quoted at the end of the game as saying “Choice Bro”. In round 2 of the SVL season the honours girls played Sydney Uni, in a tight match resulting in a loss for the girls, 2-3. With only 7 players this week due to overseas travel. the team welcomed back their captain Wendy Edwards onto the court after a series of injuries. The first set came with UTS wiping Sydney Uni of the court, but the girls weren’t ready for the fired up players on the other side of the net when they took the court for the second set. Although the loss the girls still played well considering there lack of team mates with great passing by the libero Gabes, actuate sets from Anna and kill hits form the outside hitter Carrie. Week 2 saw Div 1 UTS1 play against the tardy Korean team who stepped down from honours divison. Their 6th player barely managed to make it on to the court as the refs whistle blew. Set 1 started strong with UTS having the lead most of the the way, except a few errors towards the end and a loss. Set 2 with new found vigor and great teamwork took the win, Set 3 and 4 very close games but ended in a loss. Highlights – great serving by Alex and Nith. Good attacks through the middle by Alvin. Future focus on back court communication and serve reception. Round 2 saw us play in freezing ice cold conditions against Baulkham Hills Colts. Given the international cast in our team, we have to make allowances for frequent overseas travel, so we welcomed 2 new players to our team this week, Luke (x-Honours Team) and Nigel who stands at 2.3 metres tall! Nigel passed the induction test by wearing Bruna’s size 8 playing top without any complaints and managed to run a few great quick plays thru the middle. Cris arrived just as the scorer was crossing names off the sheet, and this meant Tony had no choice but to read the riot act to everyone regarding punctuality. Result: 3-0 WIN UTS2. Our team played our arch rivals Baulkham Hills in round 2 of SVL this week. Missing a few players meant that for the 2nd week in a row had to get Danni Rogerson out of retirement as well as borrow the honours Libero, Gabes. In a close match that should have been over in 4 sets, we eventually came away with the win 3 sets to 2. A great start to our SVL campaign with 2 wins from 2 matches. The young UTSSS1 team proved they are more than capable in the Women’s Division 1 competition beating defending champions Manly 3-1. Consisting of only junior players from feeder School Santa Sabina College, UTSSS1 played with maturity and discipline. The team stuck to their game plan and played with a positive attitude throughout the match. The 1st set was a seesaw ride with both teams going point for point but UTS were able to finish off the set with some aggressive serving 25-21. A poor start with problems in the passing line had UTS trailing throughout the 2nd set and going down 13-25. After some stern words from the coach, the team came back out firing in the third set. Once again aggressive serving was the key which allowed UTS to tactically defend against Manly and counter attack effectively. Though the final score was close 25-23, UTS were always in control of the set. With confidence the youngsters started the 4th set well finding rhythm in both defence and attack. Blocking and hitting aggressively, the girls were in total control of the game winning the final set 25-16. “It was good to see the girls not play like a bunch of princesses” quoted the happy coach at the end of the day. 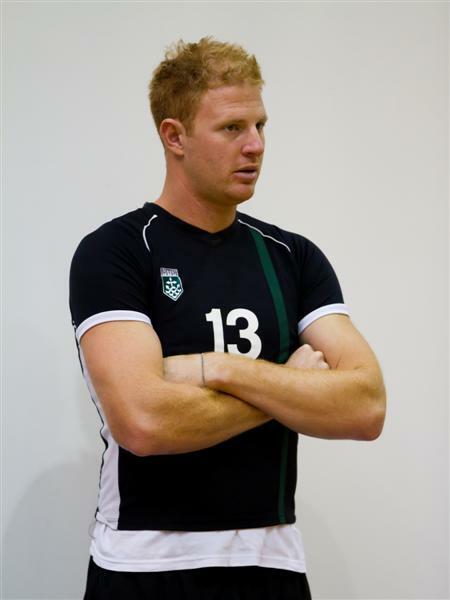 The UTSSU Men’s Australian Volleyball League team trial dates have now been set. We are looking at selecting a squad after the trials & begin training sessions on the 5th of August. The squad will consist of 16 players, with 4 of those being development players. 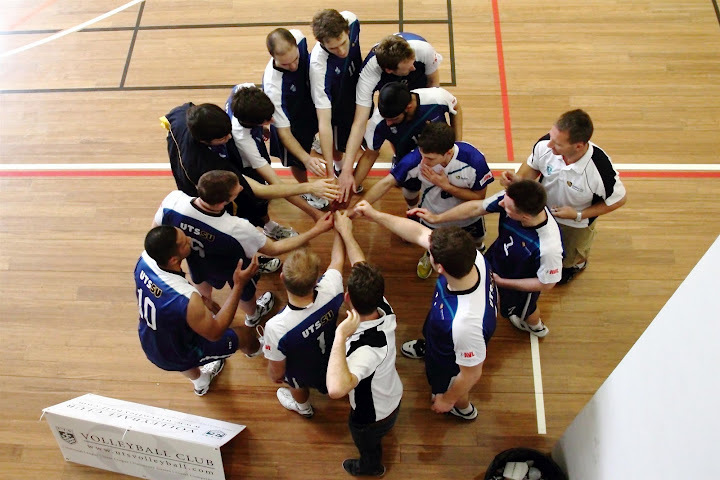 One of our club members grabbed some video footage at the Newcastle State Cup 2012. Some of the Honours men playing UNSW. And against the Newcastle team in the final. There is a clip of the women’s Honours team. And a clip of the Honours men in spiking warm up. Thanks to George for putting the clips together. The first week of State Volleyball League was on Sunday 17th June out at Olympic Park Homebush. The UTS teams were all in action and everyone looked great in the new hoodies (including the kids). Short notes on each team are below. We also had a number of people go to the Recognised Prior Learning Referee Test to qualify for their District Referee Badge. In a game that excited the crowd (of 3) about as much as a grass-growing competition, UTS came away with a 3:0 victory over KVAA, who after suffering their second straight sets defeat of the day, decided to pull out of Men’s Honours and move down to Division 1. Captain Rob “do you have a wussle” Fleury having had a solid all-round game, had the following comment to make after the victory – “choice Bro!”. Our first game of SVL was a big success and can demonstrate the evolution of our team. We won 3×0 against the Dragons (team that we made semi-finals in Newcastle and lost), in a game well architected by Lionel (coach), who strategically positioned the team in a more aggressive configuration. Although we had several players injured before the start of the season, most of us were able to do the first game and showed a confident and happy volleyball. Great start of competition!! The guys started the season with 2 solid sets on the back of some strong serving and reception. Unfortunately volleyball games are best of 5 sets. So…A disappointing 5 set loss, but many good lessons learnt. The highlight was a massive 6 pack delivered by James in the first set (way to celebrate prematurely by the way…) but at least we won the point this time. Solid work all the way through by Gino and James. Our first game was against the Dragons with UTS Veteran Tony Wibowo rejoining the team as libero and taking control of the back court with his experience. Marielle returned as coach and had to battle the joys of coaching a team full of coaches, but her persistence paid off and she managed to take control of the team for a comfortable 3:1 WIN! The 4th set saw Ricky take charge as alternate middle blocker, with some great shutouts and every quick ball hitting the opposition’s floor. After the match, 3 of our players passed the Referee’s Level 1 RPL Exam so we now have 3 District badges amongst us. Our team came up against a much improved Sydney North team in round 1 of SVL. In a very inconsistant game on our part we managed to come back from 2 sets to 1 down and win the match in 5 sets. Highlights included the strong power hitting of Hortense Mamy in her new role as opposite and the strong serving of Bek Gaspersic in the crucial 5th set when the game was up for grabs. Well done girls. A good start to the SVL season. You are currently browsing the UTSVC blog archives for June, 2012.